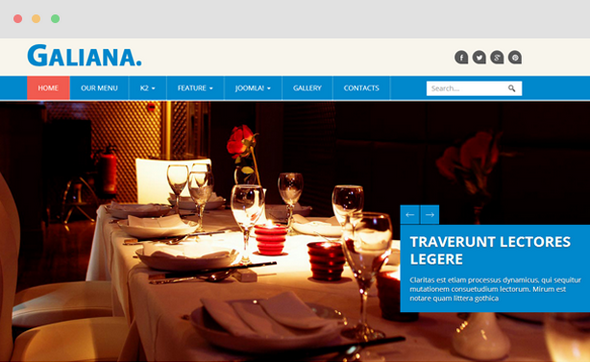 JUX Galiana is a simple, eye catching and fully responsive Restaurant Joomla Template.This template attracts viewer to discover the page and is full of easy-to-customize animated CSS effects. Using Bootstrap, HTML5 & CSS3, JUX Galiana template is friendly with social networks and compatible with all mobile devices. Also powered by fully integrated K2, Mega Menu built-in, Real Responsive Menu (save you $18), clean and simple Gallery, it is the right choice for restaurant websites.